After the unfortunate and sad departure of John Galliano from Christian Dior, there are still a lot of talks about where the house is going with Bill Gaytten, who, in my opinion, must have such pressure taking over this mega-brand with so much hype. His ready-to-wear collections have so far been received with so-so reviews and I must agree that they didn’t really impress me too much. 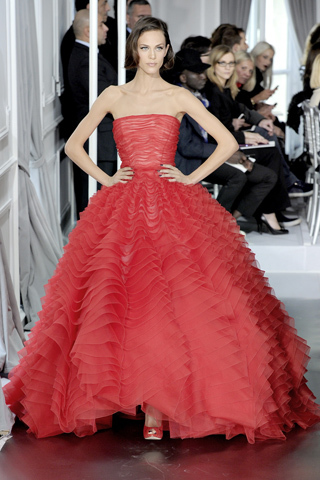 But his Couture line for the spring of 2012 was fabulous! Although I do admit, I still miss John Galliano and his genius talent to perceive beautiful and spectacular fashion that was almost theatrical. I know the fashion world in RL is already talking about 2012-2013 but the regular mortals such as us, we are more concerned about this coming spring! So I decided to take up some favorites from Christian Dior’s Spring 2012 Couture line under Bill Gaytten as some of this collection definitely looks like something we can wear in SL! The whole collection looks like a back-to-50’s type silhouette but with contemporary elements added for today. Very elegant, fun and chic! Definitely something I like! So let’s see some pics from Gaytten‘s past collection for this coming spring. This entry was posted in Uncategorized and tagged Christian Dior, couture, fashion news, fashion review, haute couture, Kay, Kay Fairey, RL fashion, RL Fashion, SL fashion, SL model, Spring 2012 by Kay Fairey. Bookmark the permalink. Reminds me of the styles of the late 1950’s and early 1960’s in America. The only difference is the sheer fabrics. Better hope you have on what your mom told you………….clean pretty underwear. hahahaha yes absolutely! It reminds me of the fashion in those times too…maybe more chic compared to that period. But I loooooove retro/vintage fashion and this is definitely something that tickles my taste bud. If they were more affordable in RL, then they’d be perfect! Lovely collection i can see kimmera and vegaciell having that collection brought into sl. I adore these so much! Thank you, again, Kay! I wandered into Tres Beau for no particular reason last week. I hadn’t seen Kay’s hint yet. I had been thinking of Gaytten’s collection and whether I should begin to learn to use Maya or Blender. And then…..